Recently posted for Argos, now showing at same price on Amazon. Seems a very good price in comparison to most other sites. Available with free delivery £10 spend/prime/Amazon locker delivery services. 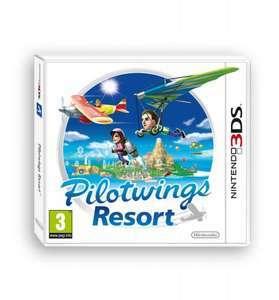 Pilotwings Resort puts the player in the pilot's seat as never before in this long-awaited Nintendo PR three dimensional update to the Pilotwings series! Import your Mii characters from the Nintendo 3DS Mii Maker and explore Wuhu Island (the star of Wii Sports Resort and Wii Fit Plus) by plane, by hang glider and by rocket belt. Each vehicle type features unique controls that offer a different challenge. Complete around 40 challenging flight missions in Mission Mode to earn stars, or scour Wuhu Island for hundreds of collectible Extras in Free Flight Mode as you unlock interactive 3D Dioramas of various aircraft and famous island monuments. Get a bird's-eye view of familiar Wuhu Island sites - and a few new ones! You can even share your experiences with friends and family members by taking in- game photos and saving them to the Nintendo 3DS photo album. Pilotwings Resort is an aerial sports game gem that offers amazing 3D views of Wuhu Island. Share the fun with family and friends: You can snap photos of postcard-perfect locales on Wuhu Island with the hang glider in Free Flight Mode and as part of select challenges in Mission Flight Mode. £6.99 at Argos click and collect. Amazon is just easier for me than Argos so thanks OP. But rude not to at this price! Amazon is just easier for me than Argos so thanks OP. But rude not to at … Amazon is just easier for me than Argos so thanks OP. But rude not to at this price! An amazing game for £7. awesome deal, lost my copy some time back and was after a cheap way to replace it, thanks for posting the deal. awesome deal, lost my copy some time back and was after a cheap way to … awesome deal, lost my copy some time back and was after a cheap way to replace it, thanks for posting the deal. Hot, I've been a fan of pilotwings since it came out on the SNES. I wish they'd come up with a WII U version. Hot, I've been a fan of pilotwings since it came out on the SNES. I wish … Hot, I've been a fan of pilotwings since it came out on the SNES. I wish they'd come up with a WII U version. Hopefully it's in the pipeline! Thanks reserved a copy to pick up tonight from my nearest store which is … Thanks reserved a copy to pick up tonight from my nearest store which is couple of minutes away from where I live! Your welcome, it was cheaper for me at Argos as I don't get free delivery on amazon. I have no experience of this series of games so just wondered if a 4.5 year old would get much fun from it? He's mastered every Mario game going so would like to try something new. Trying to check the stock on the Argos site, having no luck at all. Its been like this for days now, DAYS!!! Come on Argos fix your site already!! Looks like an epic fail from one of the larger retailers, not good!